We may have a few final pairs of 1ct each ear shortly - these are the last of our 1ct size though. 2ct each ear and 1.25ct each ear will be restocked end of March. Overnight Earrings: Our Dazzling Amora Super Ideal Eternity H&A 4-prong Martinis, in Platinum, with Protector Locking backs. Update 03/05/19 : We are again completely sold out of Amoras in the 6mm size and 6.5mm size, and do not have any other Amora Overnight Earrings in stock. 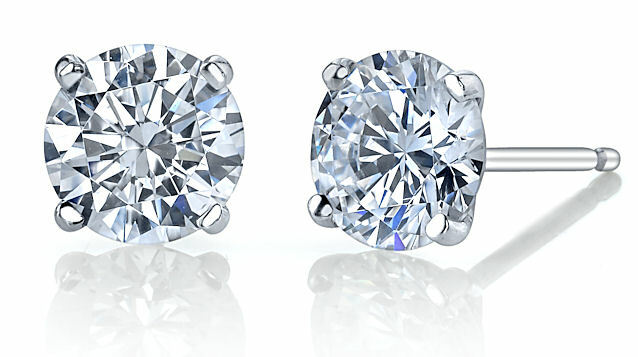 Update 03/04/19 : One of our last but most stunning 1ct each ear studs is now available - D/IF and D/VVS! Otherwise, we are completely sold out of Amoras in the 6mm size and 6.5mm size, and do not have any other Amora Overnight Earrings in stock. 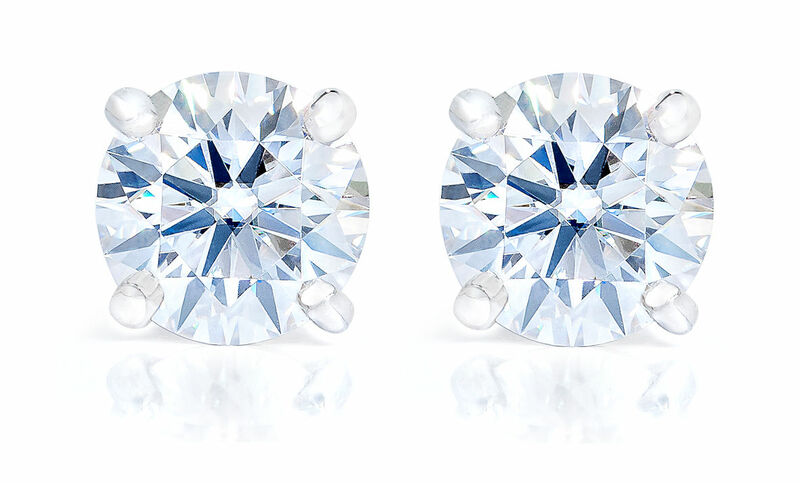 Update 1/19/19: We are down to our last few pairs of overnight earrings for the 1.5ctw (.75ct each ear) and 2.10ctw (1.05ct each ear). We have no more 6mm rough in suitable size to cut more Amora Eternity .75ct and only a few left for 1ct, so this is the end of the road for those sizes other than what is left. Growing to 1ct or .75ct size requires a lot of luck, which is why it was only this past year we were able to offer it (out of 5+ years of Amora production). We are hoping to have Takara (our lab grown diamonds) in these sizes soon to offset the end of the Amora Eternity in these sizes. *New - Due to popular request, we are also offering 'Universal pricing' Overnight Eternity studs. These are Amora Eternity with no independent certification, sold at flat rate pricing and have become our top selling earring option. 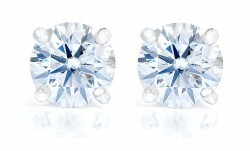 Example: 1.05ct, E-F color, VVS each ear, with no certification. These are true Amora Eternity, however, we simply offer them at a Universal Flat price per size, allowing you to save on not having the independent certification costs and thus keep the focus on sparkliness in your ear. Why are our overnight Eternity Earrings so popular? First, Amora Super Ideal Eternitys readily match or exceed diamond H&A in beauty. 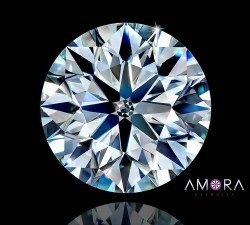 Amora's have even been appraised as $55K mined diamonds at a regional diamond grading lab :). Even with matching or better beauty, Amora Eternity's are up to 21x better value. 1.09ct D/VVS2 H&A Diamond (Blue Nile Astor Ideal) $15,896.00 (closest match) * 2 = $31,792.00 (diamonds only). 21x Financial Improvement vs H&A Diamond! Yet the Amora Eternity can easily be paired with next to a $45K H&A diamond due to Amora Eternity being cut same or superior to even H&A diamonds. (equivalent of AGS-000, the very best and required for true H&A diamonds). For reference, "H&A" Moissanite is only AGS-4 and regular Moissanite is AGS-10 (worst) cut grade. Note that we often have pairs of Eternity Super Ideal H&A perfection in stock - D color, Internally Flawless - E Color, Internally Flawless! Give her the absolute best. In addition - we use Platinum for the mountings and then finish these with rhodium plating to give you a stunning high gloss finish while keeping the durability of platinum. We also polish the interior of the earring prongs before seting (this is normally only done in the finest of earrings) and then set the Eternity Amoras, to ensure that every angle of your Eternity studs, even in the interior, has sparkle and life. I received the ear rings this morning and they are gorgeous! My wife loves them. Thank you for such rapid delivery. I ordered them late in the day yesterday and received them this morning. Amazing service!! All I can say is that you did an amazing job!! Absolutely beautiful!! I have a pair of D color VVS diamond earrings, and when I compared the diamond to the amora gem earrings side by side, I cannot tell the difference at all!! Amazing job! And thank you for getting it to me on time for a special occasion! I have received so many compliments on the earrings! Love love love it!! Just wanted to say WOW!!!! LOVE my earrings!!! They are absolutely stunning ~ wouldn't have a clue I wasn't looking at diamonds..... and they are very comfortable to wear, I forget I have them in! Totally impressed with the eternity cut ~ you really nailed it! I look forward to picking out a round for my ring this next year. Thank you for such a wonderful product, and of course, for the best customer service always! I ended up ordering the 2cttw amora eternity earrings. I took them to Zales to compare to diamond earrings, trying to decide which route to go for my girlfriend. I had never seen an amora gem before. FYI they did test as moissanite on their diamond tester, but were superior in appearance to the diamond. [admin note: Amora will test positive as diamond on basically all pen type testers, and 50/50 odds if it tests as moissanite on Moissanite testers. Moissanite and Amora are in the same crystal family]. 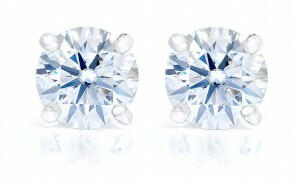 Let me preface this review by saying that I have two pairs of diamond stud earrings in platinum settings (E color 0.33ct each ear, and E color Hearts and Arrows 0.5ct each ear from a famous H&A brand), so I can give a fair comparison of how my Amora Eternity stud earrings measure up against diamond stud earrings - and, boy, do they measure up!! My Amora Eternity stud earrings are the most sparkly pair of stud earrings I own. Yes, they can definitely hold up to hearts and arrows diamonds. And, as a bonus, since I don't remove my stud earrings every day, the Amora Eternity studs don't seem to get greasy/filmy as quickly as my diamond studs do, so they stay super sparkly longer. I won't even go into the savings but since the Amora studs are easily equal to, or even more beautiful than my best H&A diamond studs, I won't be spending my money on any more diamond stud earrings in the future!